I have just completed a project in Marion that began with a torn page from a magazine and the wish for a “castle-like” atmosphere. My Clients fell in love with the grand mantle piece in their inspiration photo (see below) and had to have it in their home. Here’s where my job begins! I needed to bring their dream kitchen, shown in the magazine photo, to life. 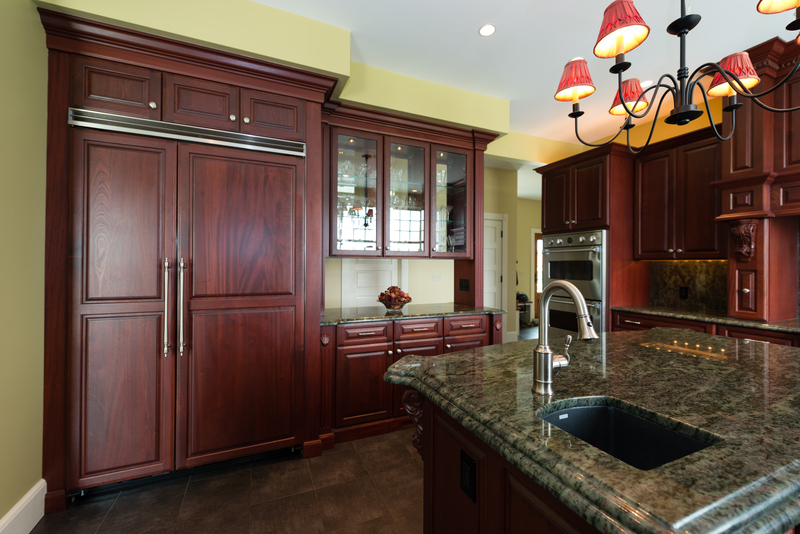 I did a bit of research and the inspiration kitchen featured a deep stained cherry cabinetry with a heavily-detailed, traditional-style, raised panel door. As for the countertop, the display kitchen appears to have used a green marble (which we all know is not rated for use in a kitchen, right?). 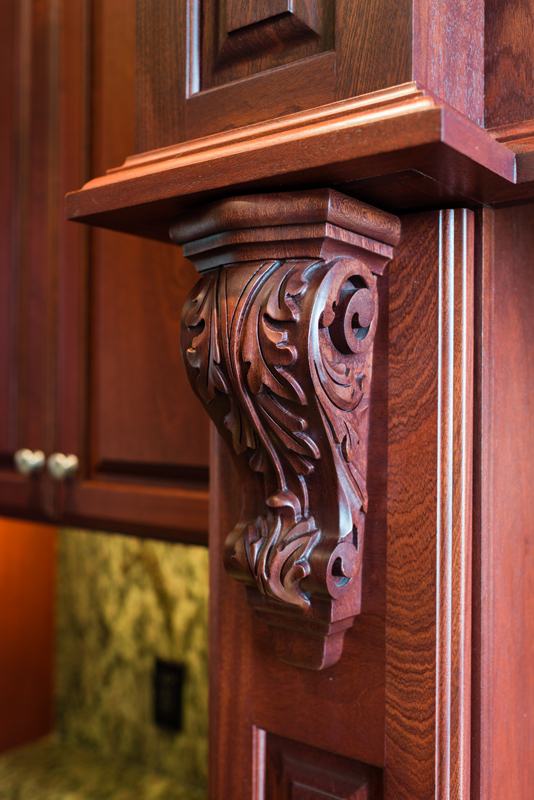 While touring the Client’s beautiful, waterfront home, I discovered that there were existing mahogany built-ins and architectural details in other areas of the home. 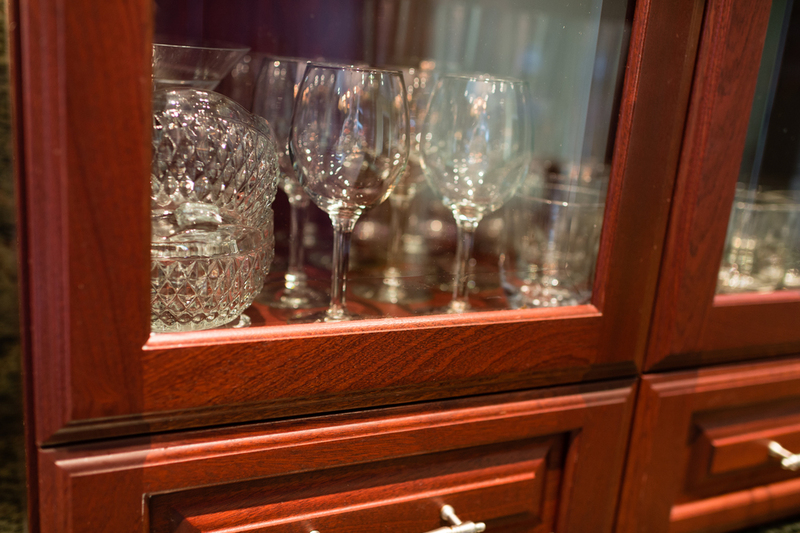 This guided me to the obvious choice of suggesting a richly stained mahogany (from our custom Plain & Fancy line) in the new kitchen to keep with the style of the home. 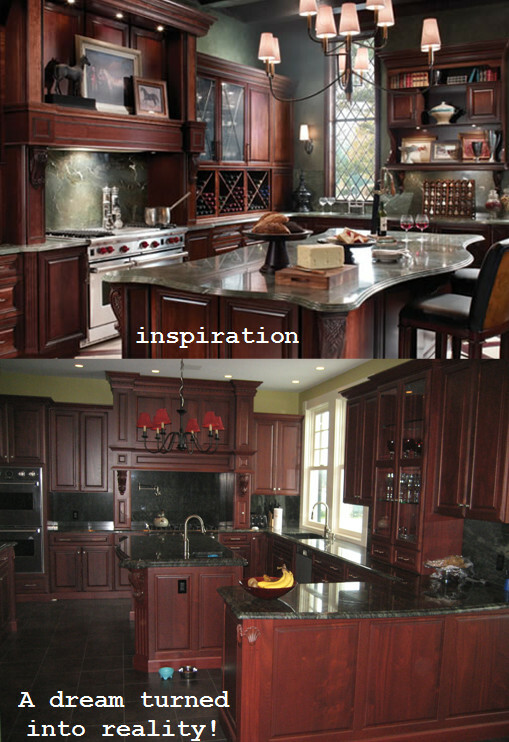 The mahogany definitely lends the same “feel” as the cherry in the inspiration picture, but creates a uniqueness that sets their kitchen apart. The clients and I also poured over a ba-zillion granite samples trying to find one that would create the same drama as the green marble, without the maintenance nightmare. We stumbled upon Kerala Green, which worked perfectly! 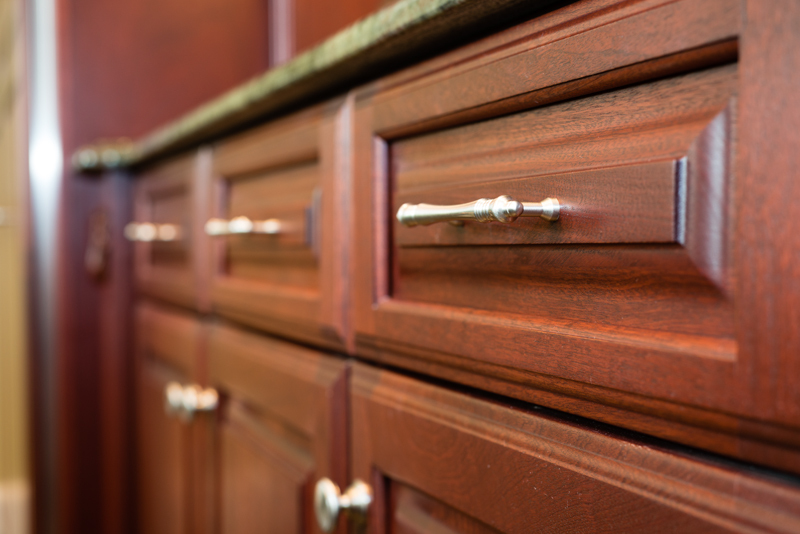 Creating a grand kitchen space is ALL about the details. For example, I custom designed the 7ft. mantle to imitate the design from the inspiration kitchen. 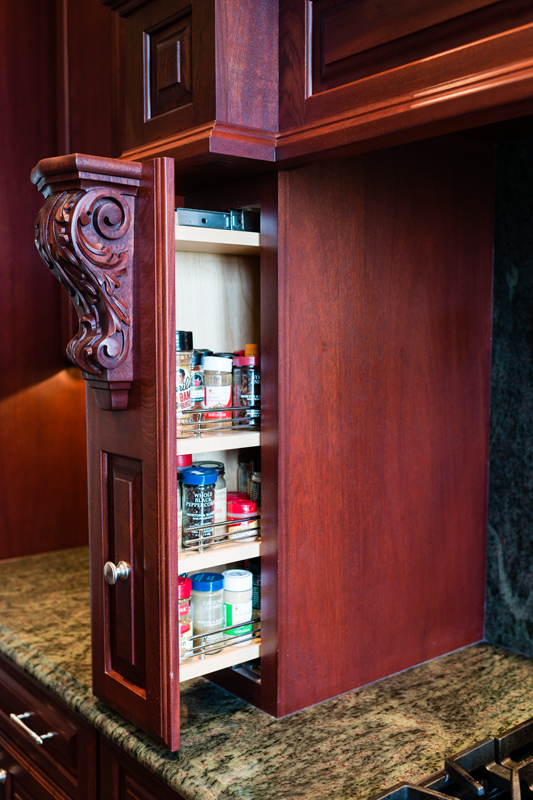 This mantle is not only a show-stopper visually, but also discreetly houses the super-powerful ventilation system and pull-out spice storage. I also specified several custom hand carved decorative pieces (placed strategically throughout the kitchen), beveled glass cabinetry, paneled appliances, and beautifully curved countertops. A phenomenal space fit for any castle and (in my opinion) more breathtaking than the inspiration! Our clients are in the process of moving into their newly re-modeled home and we hope to visit them again for a professional photo shoot. More photos to come! 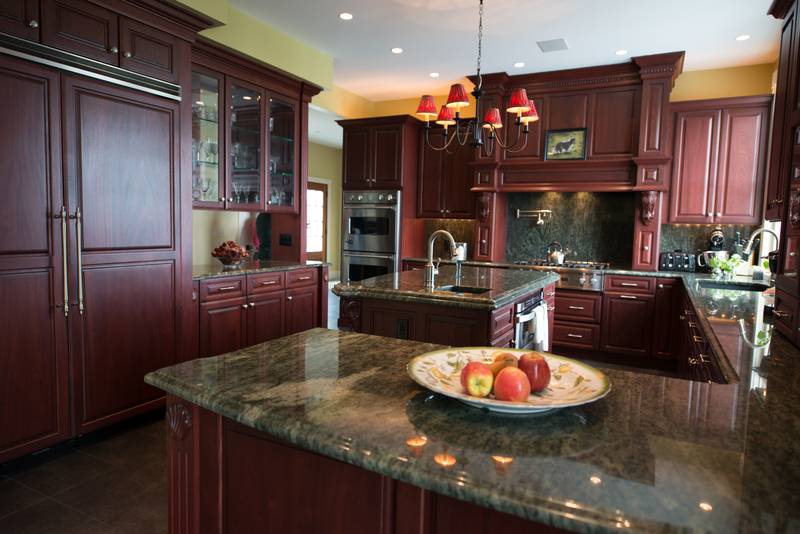 Our "Allen's Point Castle-Like Kitchen" client graciously allowed us to visit her home with photographer, Phil Mello of Big Fish Studio, to shoot some more photos of this stunning kitchen. She is so thrilled with her kitchen and expressed how much Tena exceeded her expectations with the design. Her inspiration photo not only came to life, but it turned out much better! A few months ago I started a project in Marion for a couple with young kids. The wife adored Carera Marble and so badly wanted to make it the countertops in her kitchen. After having the above conversation, we decided the upkeep was not for her nor the rest of her family. With that said, we moved on to other options. In the end, she and her husband agreed on a phenomenal stone called White Zito. It has the graceful, organic movement of marble and the colors couldn't be more perfect. So, we were able to get the look she was after without having to stop all red wine and/or kool-aid drinking in and around the kitchen island! The kitchen was installed last month and my clients are thrilled! For more articles about putting marble in your kitchen, I found the following website: http://kitchen-counter-tops.net/marble/index.php . It seems to be super helpful and has a wealth of information! Or, stop in at Details to see me and our countertop sample room!